We at Campbell’s Construction have almost a decade of experience serving Belle Mead and the surrounding areas. Whether you need a new paver patio, walkway, or driveway installed or your vinyl siding repaired or fully replaced, the Belle Mead remodeling contractors here at Campbell’s Construction have the expertise to provide you with those and many other services. We understand that the look and QUALITY of your home or business are pinnacle to you, especially for the money you might have to pay for some construction services. Consequently, we make it our mission to provide only the highest-quality service and materials at the most competitive prices so that you can enjoy the home or business of your dreams for years to come! The aesthetic and functionality of your home or business are equally important to any homeowner or business owner. The New Jersey remodeling contractors at Campbell’s Construction are experts at providing you an excellent-looking home or business that will also last for years to come. We use only the highest-quality products to ensure that your new walkway, driveway, patio, or siding will not only look great but also last for many years to come. 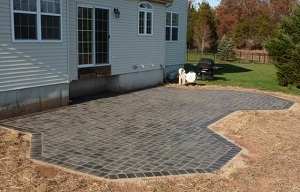 A good-quality patio or walkway can add to the value of your home or business. And with Campbell’s Construction’s dedication to providing the most affordable service that we can, you can quickly be making back the cost of construction in increased equity. On top of beautifying your home with a walkway or patio, we can also extend the lifetime of your driveway by installing a new one using smaller pavers that are less likely to crack than larger slabs are. The siding on your house is important in keeping out the elements. With poorly fitting siding, you could be paying a small fortune to battle the elements and reverse their damage. Water and pests can penetrate worn siding, causing mold and even structural damage should those pests include termites. We at Campbell’s Construction can replace your old siding or install new siding, and we will be sure that we use high-quality materials to be sure that your new siding will keep your home or business safe for years. Offering a wide variety of siding types, Campbell’s Construction can provide you with beautiful as well as reliable siding. If you are looking for a reliable remodeling contractor in Belle Mead, NJ then please call Campbell’s Construction at 732-623-9790 or complete our online request form.